Guest Book with a Twist! 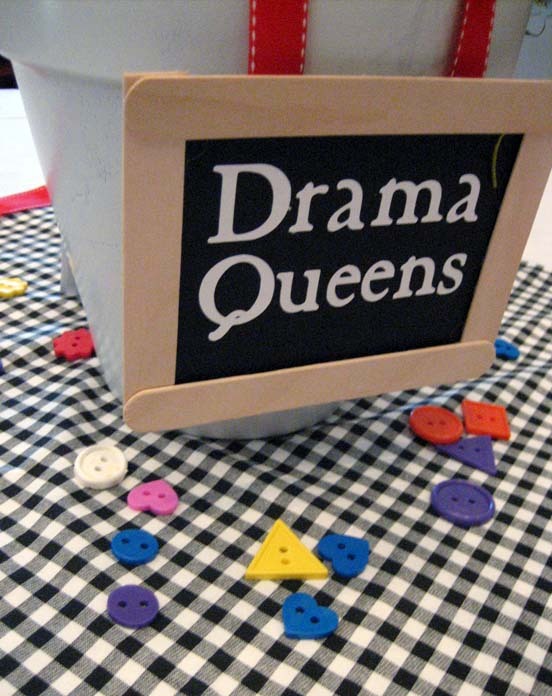 At some point during that party, your guests will be sitting at the table with some idle time on their hands. So, to keep them busy, why not have the guest book right at their fingertips! 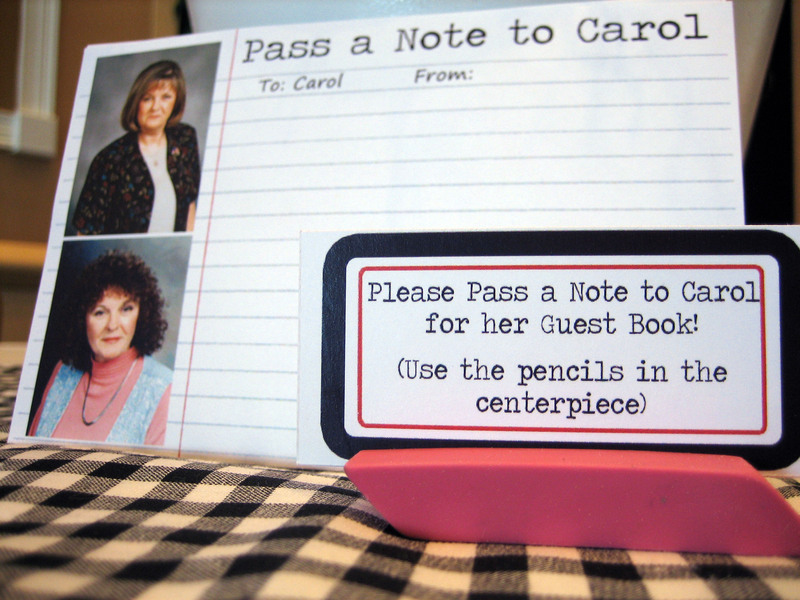 Going along with my ‘Last Class’ Retirement party theme, the guests were going to “pass a note” to her during the party. I first caught this idea from blog The Sweetest Occasions, where it had a great 80’s school themed wedding profiled. I used past pictures on the pass a note (I had four different combinations of past pictures on the cards to keep it interesting!). I accompanied the guest book with a pink eraser card holder to tie into my school theme. I had mini golf pencils available for the guests to use. The cards were 4 x 6 and can be put into a photo album easily. I plan to place the note cards amongst the pictures from the evening. 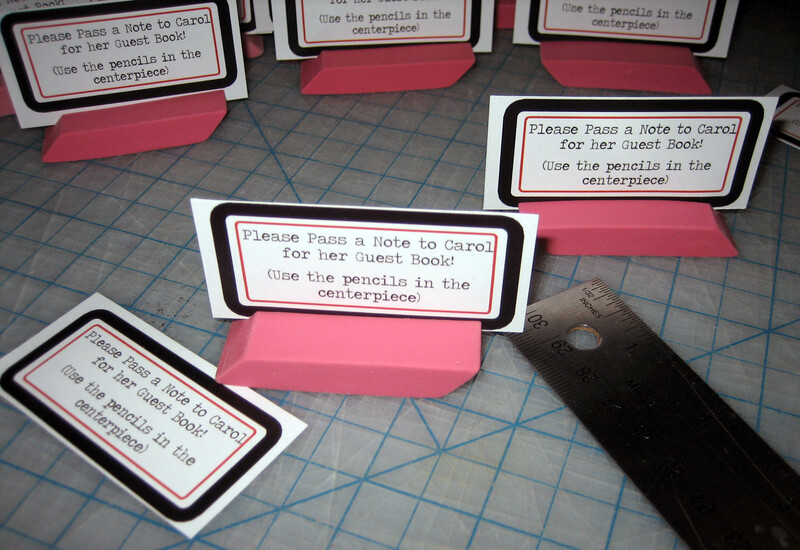 The pink eraser holders were easy to make as well– just cut a deep slit into the eraser and insert the printed card stock. I found there is a difference in pink erasers and some are easier to cut than others. The pink erasers were 3/$1, so it will not kill the budget. Finding an easy buffet and memorabilia decor was tricky. I started in August and hit up the numerous sales for back-to-school. 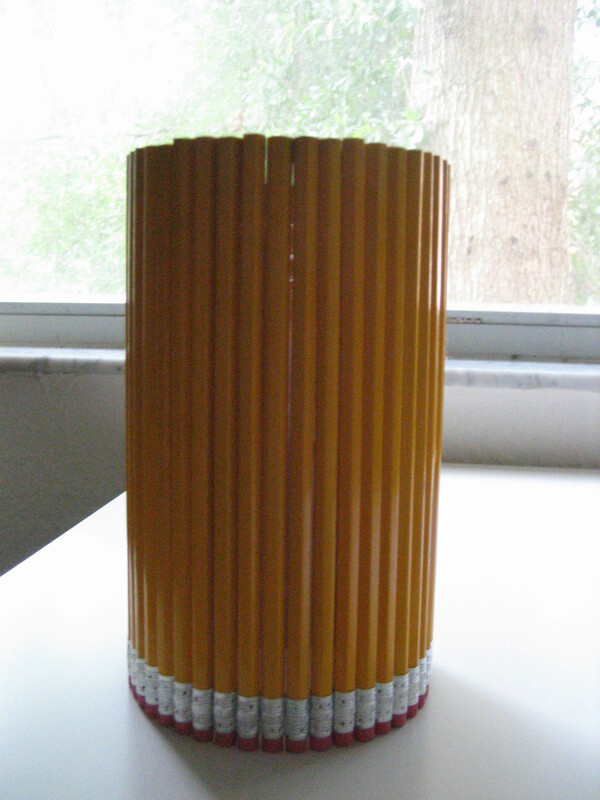 Combined with a little bit of google searching, I found a cute and easy pencil vase idea! I first saved and washed peanut butter containers. I put some spray adhesive on paper and attached it to the plastic container. 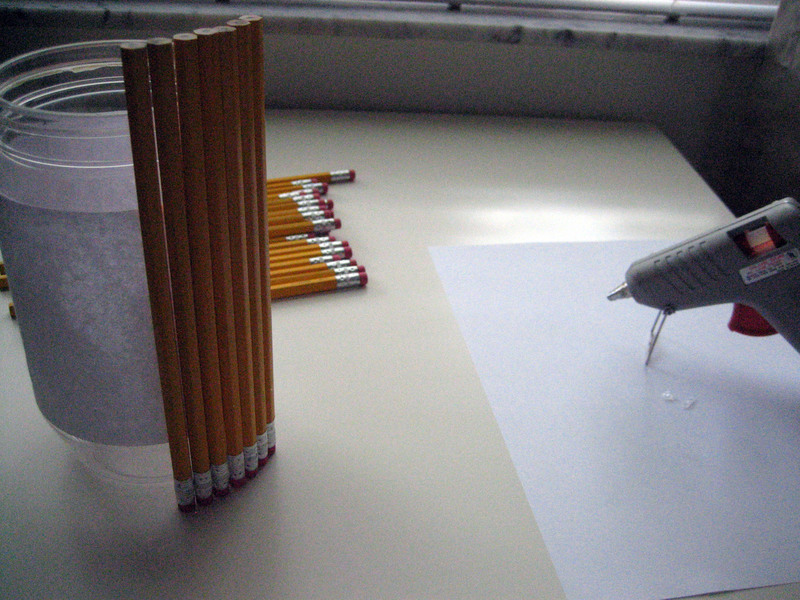 I then put the pencils, eraser down, on with a hot glue gun. I went all the way around, using the table as a level guide. The process went pretty quickly and was not too hard. I also turned the logos on the pencils so I could use multiple brands of pencils. I then put a rubber band around the pencils and placed two contrasting decorative ribbons to hide the band and glued on a bow. And viola! Easy decor for the party! Best part is that if you skip the hot glue, all the pencils can be donated/used! More pictures of the vase “in action” can be found here. 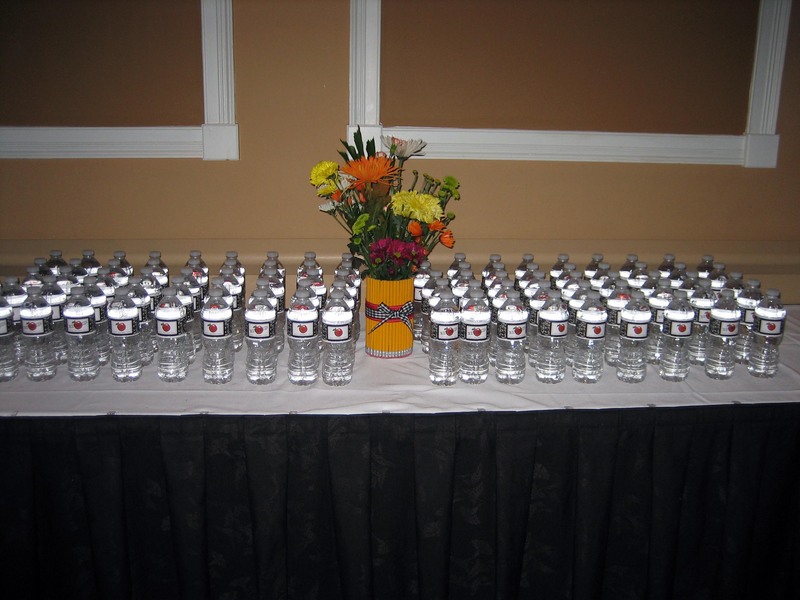 Finally finished the personalized water bottle labels for the party! They were incredibly easy! I used the same full sheet labels I bought from the invitation address labels (from Amazon.com, only $26.00/100 sheets!). 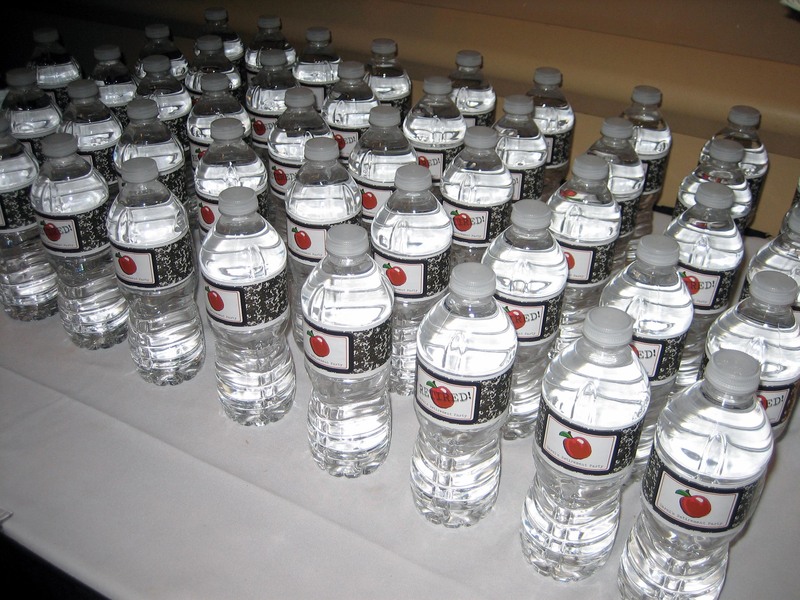 I got 6 water bottle labels per sheet– purchased water bottles from a warehouse club at $3.64 for 32 bottles. The labels were printed on a laser printer to make sure they do not bleed if the labels get wet. The dimensions of the labels are 8.25″ x 1.5″ with 0.25″ margins. I cut the labels and then had DH put them on. I made two designs and will alternate them when I put them out. Such an easy (and cheap at 16¢/bottle) decoration! The tutorial for the Pencil Vase in the pictures can be found here. 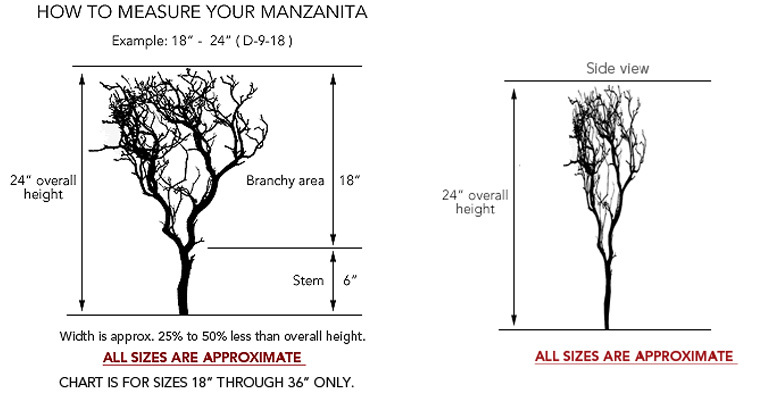 Manzanita madness, I have it. After a little research, I ordered from Nettleton Hollow, but also looked at Save-on-Crafts. Both have great options, different sizes, and color options. 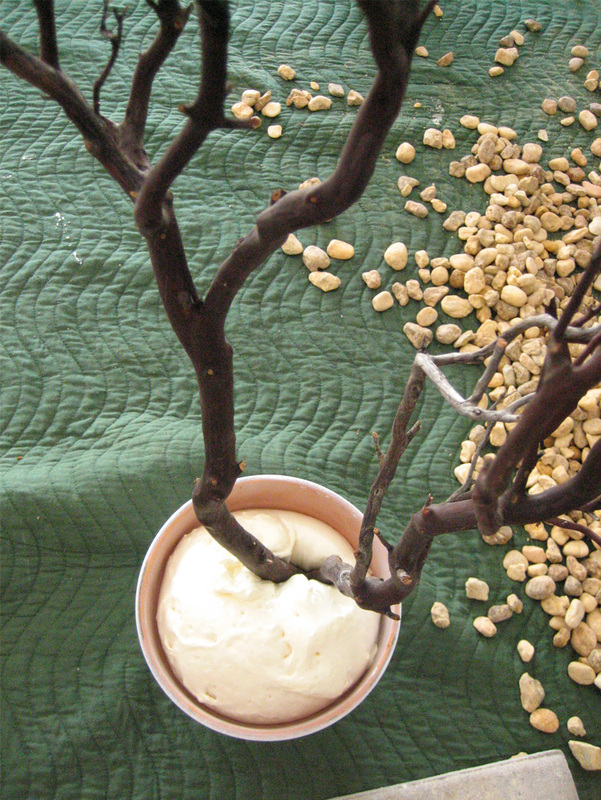 I decided on the 24″ – 36″ sized branches because my tables are approximately 8′ diameter and seat about 8-10 people. The cost per branch was about $10 after shipping costs and everything added. After the huge box arrived, I carefully lifted each piece out– they tend to get caught together, so be careful!! Being a natural product, each branch is unique and has its own quirks. Best part is that you can trim whatever does not agree with you. I decided on Terra Cotta pots because the price ($1.47/pot) and the availability of sizes. I spray painted them white (first with a cheaper spray paint that I used as a primer, and then with a more expensive gloss spray paint) to match the decor of the party. Now time for the creation! I bought stones from the store to set in the bottom of the pots to add some leverage against tipping over. 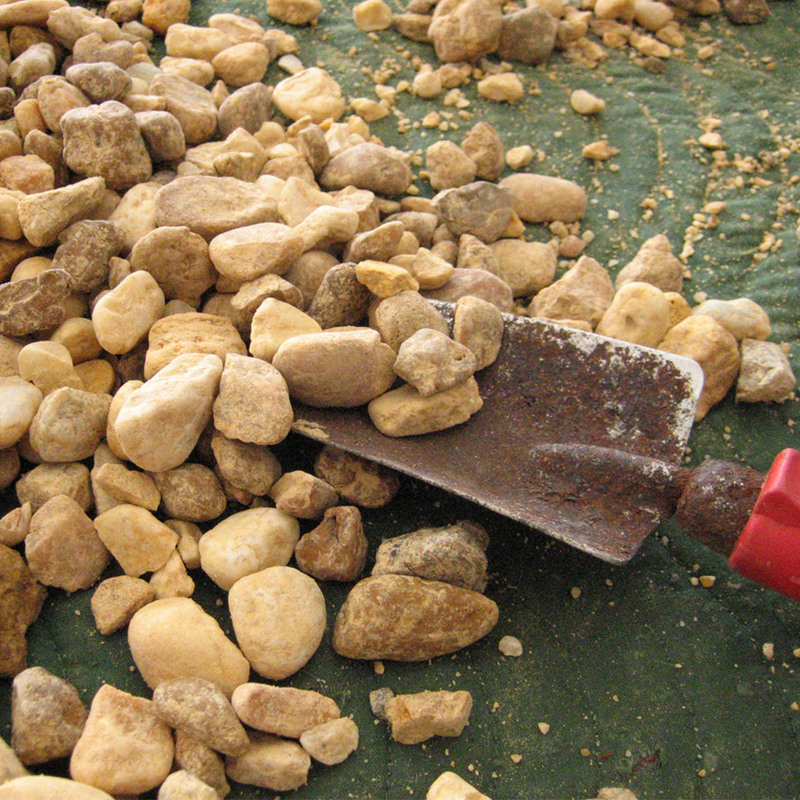 If using the clay pots and painting them, you need to make sure the rocks are dry or the it will make your paint bubble. Next I put duct tape to plug the hole at the bottom of the pots. 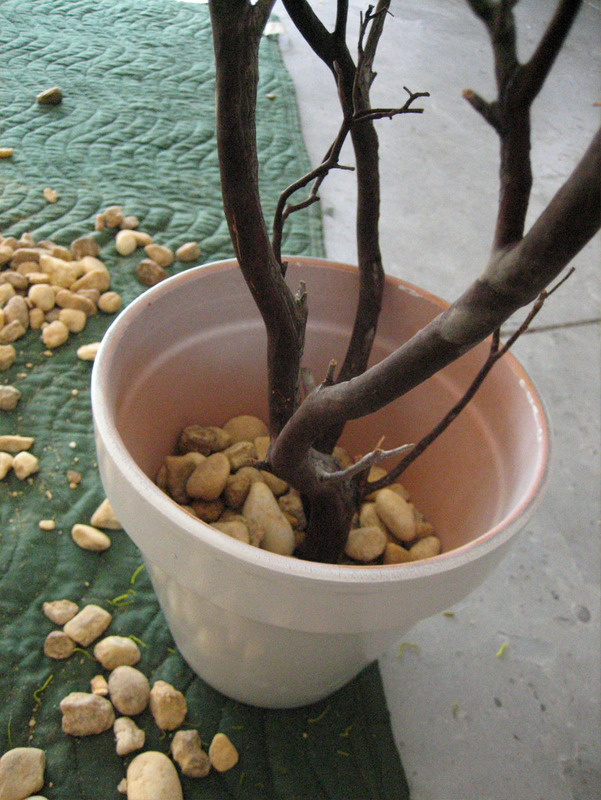 I shoveled in the rocks (a little at first, placed the branch to secure, then added more rocks on top). 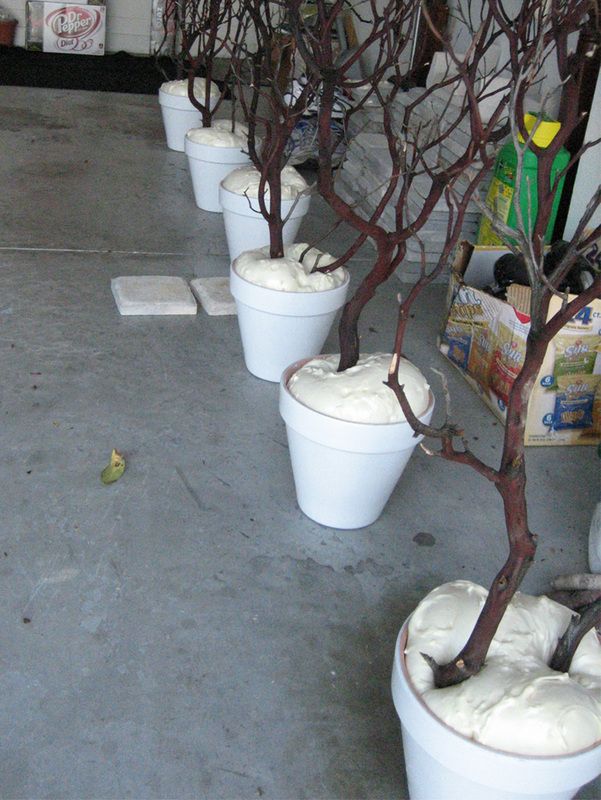 Then I had the options of how to set the Manzanita branches in the pots. One is to use plaster of paris, but after finding out that one little package is about $8, I needed a better option when I was making 12! 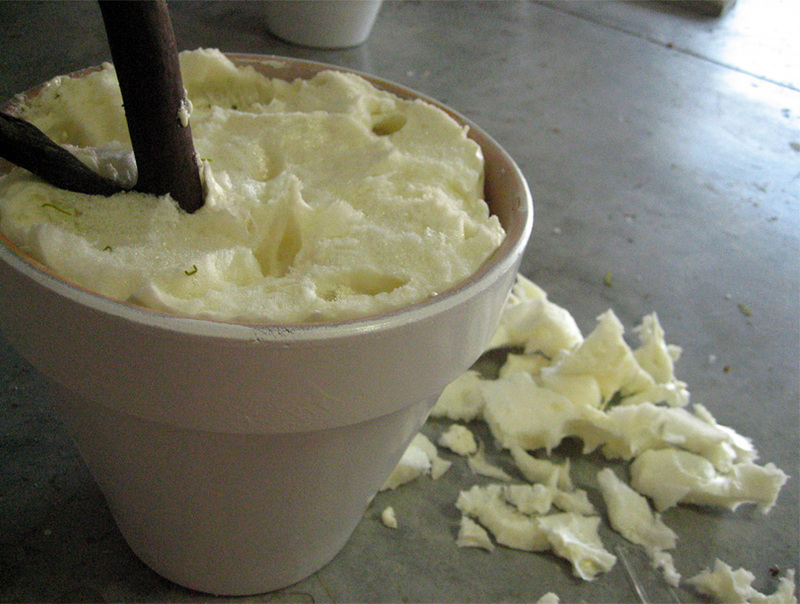 Also, the prep and time involved in mixing plaster, pouring, and setting it was a little daunting. I decided on expanding foam (about $3.50/can). For all 12 centerpieces, I used only 3 cans (mostly because I over did it– probably could have used only 2 cans if I did not have such a heavy hand). Also, follow the directions on the can about safety and precautions– this stuff is sticky and most likely only be removed with acetone (nail polish remover). Example of my bit of over spraying is below. The can said the foam will double in size, I would say in my conditions in my garage (approximately 80 deg, 80% humidity), I got about 40% expansion. I sprayed the foam in and around the rocks and around the base of the branch by pushing the spray can straw down into the rock layers. The product sets up in less than 8 hours, and then we were able to cut away the excess from my heavy handedness. I trimmed it with a plastic knife and made it slightly below the rim of the pot. The foam cuts extremely easy, and since I would be covering the foam, I sometimes ripped off what I did not want. After all the pots were trimmed, I put some store-bought green moss to cover the foam. I lightly placed some hot glue around on the foam to secure the moss for travel. And that is it! Beautiful (and easy) centerpieces that are ready to be decorated! After all this, I wanted to see how secure the branches were, so I brazenly picked up the whole thing by only the branch– the branch didn’t move, didn’t wiggle, didn’t budge. I was suprised at the strength of the hold considering it was holding the weight of the 8″ Terracotta pot, 2-3 pounds of rocks, moss, foam, and the branch itself. I would not recommend throwing them around the room like that, but good to know that this branch is very secure and can withstand a lot of top heavy decorations. 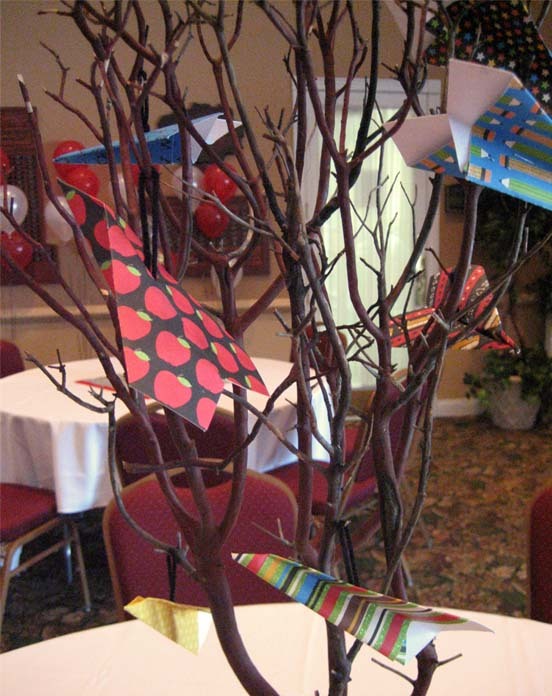 Here are the Manzanita branches decorated for the school themed retirement party. 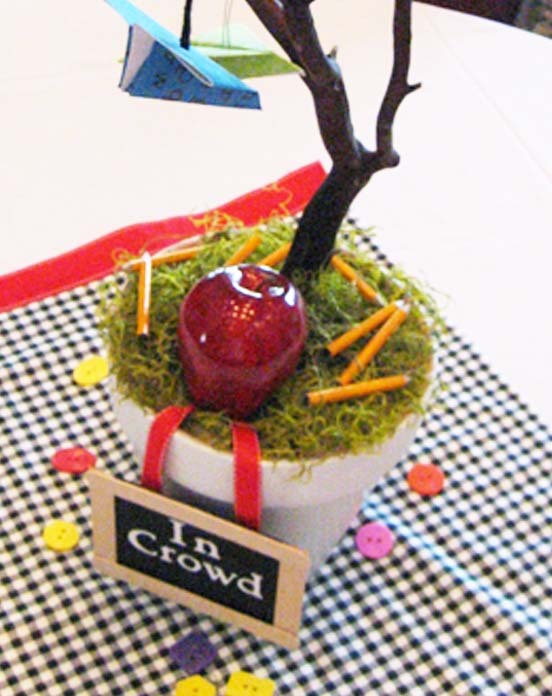 I put paper air planes and pencils in the moss with an apple and the table name. 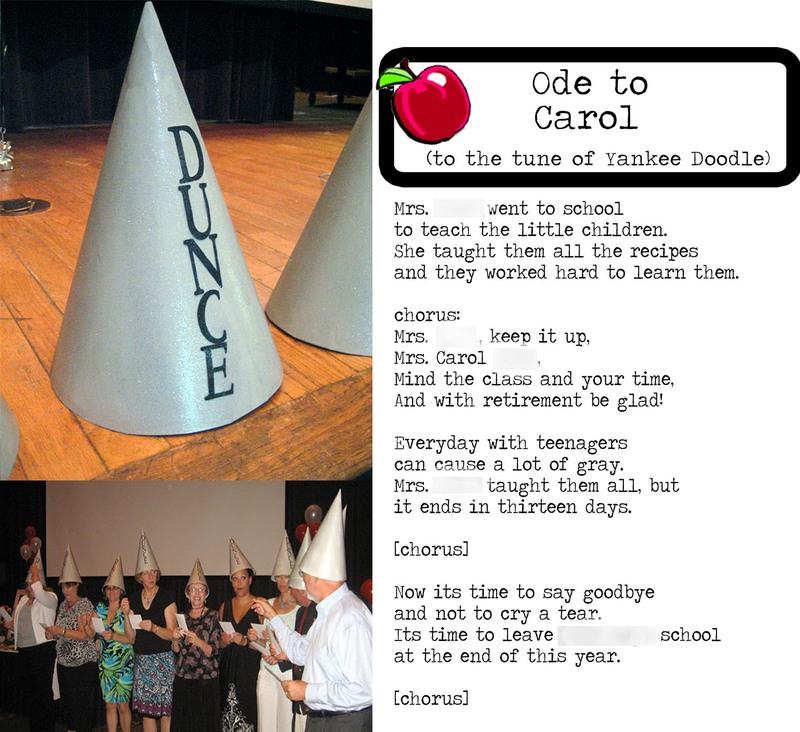 Teacher’s Last Class Retirement Party Invites! Your card should convey the kind of party you are trying to throw. For example, if your party is based on a theme, let your guests know about it, as you would not want them to feel out of place. If it is a surprise, make sure to note that as well as if you do not want any gifts brought. Along with the tone of the party, most importantly include: date, time, and the address of the venue of the party. Along with these details, also do give your phone number or email address, so that the guests can contact you, if any need arises. People usually prefer weekends to host a retirement party, so that all your invited guests can make it to the venue, and on the correct time. 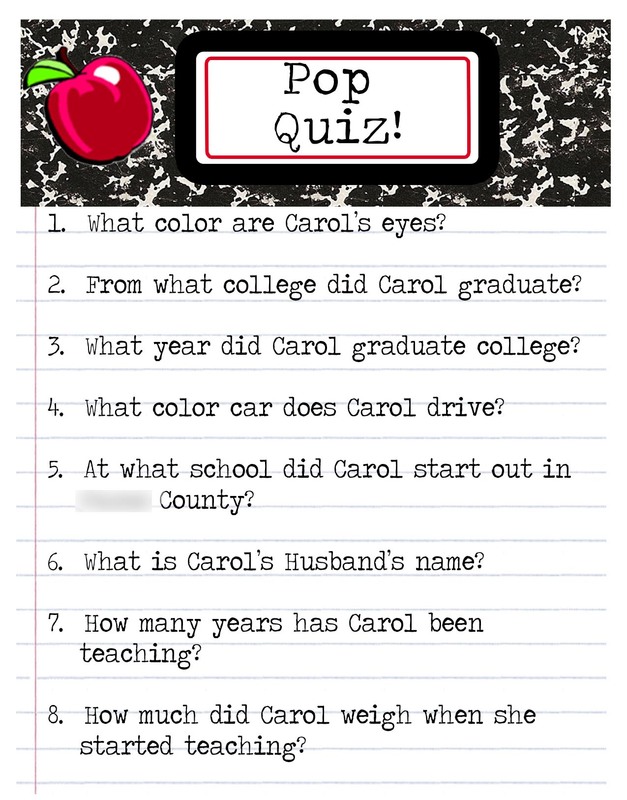 Other tips can be found here. 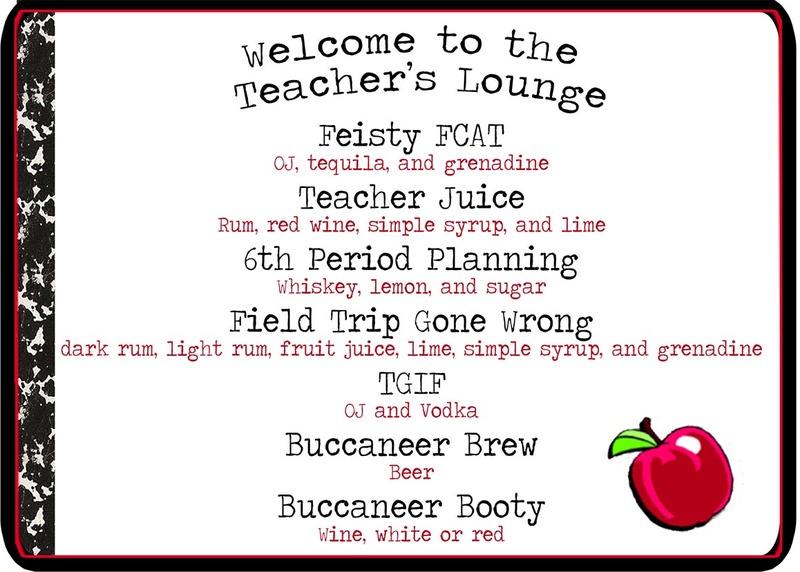 Based on the tips above, I went all out for my ‘Last Class’ themed teacher retirement invitation. The summons card had wording that denoted a more jovial and light retirement party. 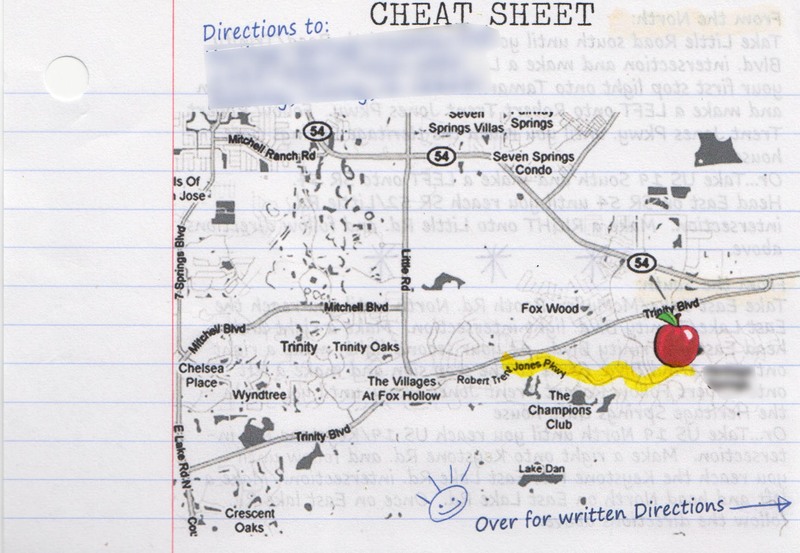 I also included a direction card to help my guests. I chose black to look like a black board effect. Ordering online is the only way to keep the cost down. I got 100 envelopes for $27.70 (28¢/envelope). But, to make the invitations a bit more designed, I opted for envelope liners. A great tutorial is offered by blog Budget Savvy Bride. I made a template as the tutorial instructed and for did the full liner for the hand delivered envelopes, but only lined the bottom section for the mailed envelopes. I believed people would rip it when opening. I made the apple/composition pattern on my computer and printed 100 full color copies to cut from. In retrospect, I would have printed this on my home printer–color copies cost $50 (50¢/liner)!! The wrap around address label was printed on full sheet labels purchased online (100 for $21). I got 5 labels per sheet (4¢/label). I printed these on my home printer. 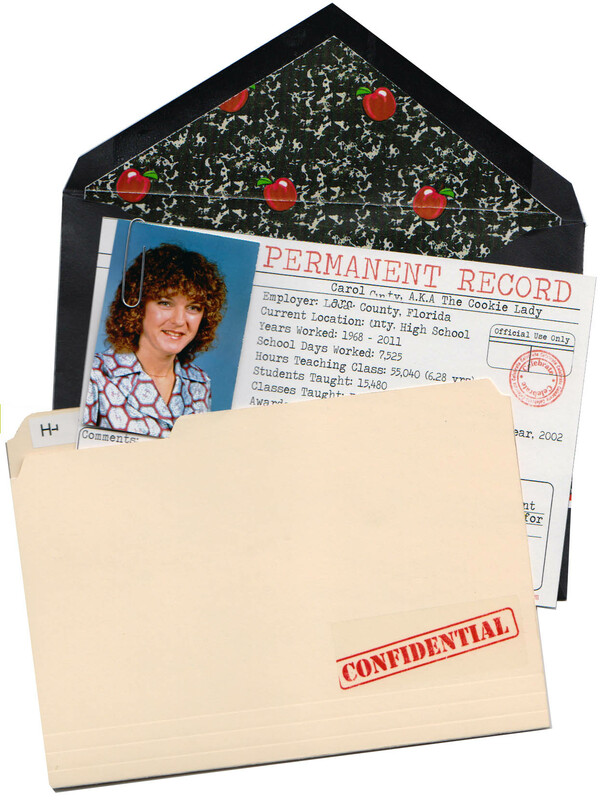 I found a template for the file folder online and sized it to be small enough to accompany a 5×7 card. I used A7 envelopes as well. I bought a pack of 100 manilla envelopes and cut one from each (6¢/folder). 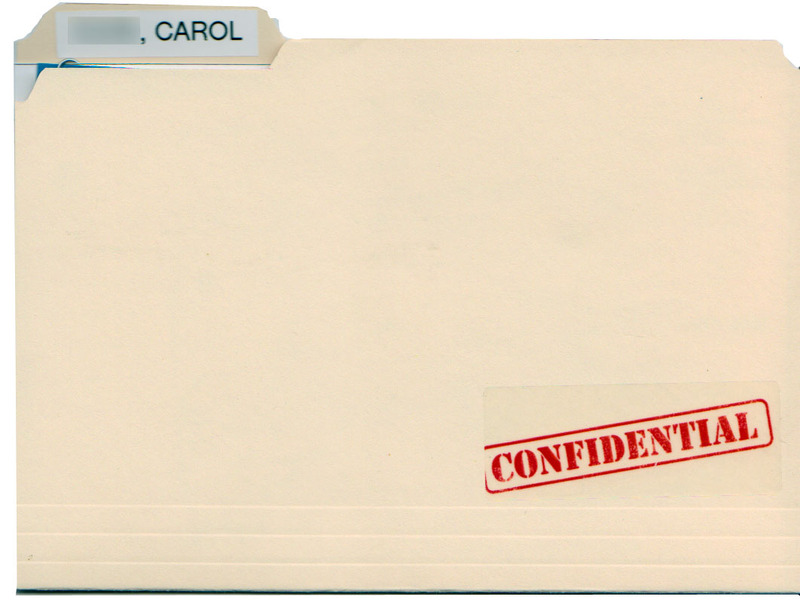 Then I had clear address labels which I printed with ‘Confidential.’ I also used my label maker to add the name to the folder tab. These are items I had, but the cost per invite would be 2¢/confidential sticker and label. Next, I went to Target and printed ‘school picture’ sized images from years past on 4×6 photos. I got 4 photos on one sheet (25¢/photo). Then I printed my invite on card stock from home. I then added a real paper clip and a bit of foam sticky squares to pop the photo up off the paper. I got the foam squares in the dollar section at target and the paper clips were 100 for 80¢. These prices were nominal to the overall invite. Using my home printer, I printed on school notebook paper I had from years past. 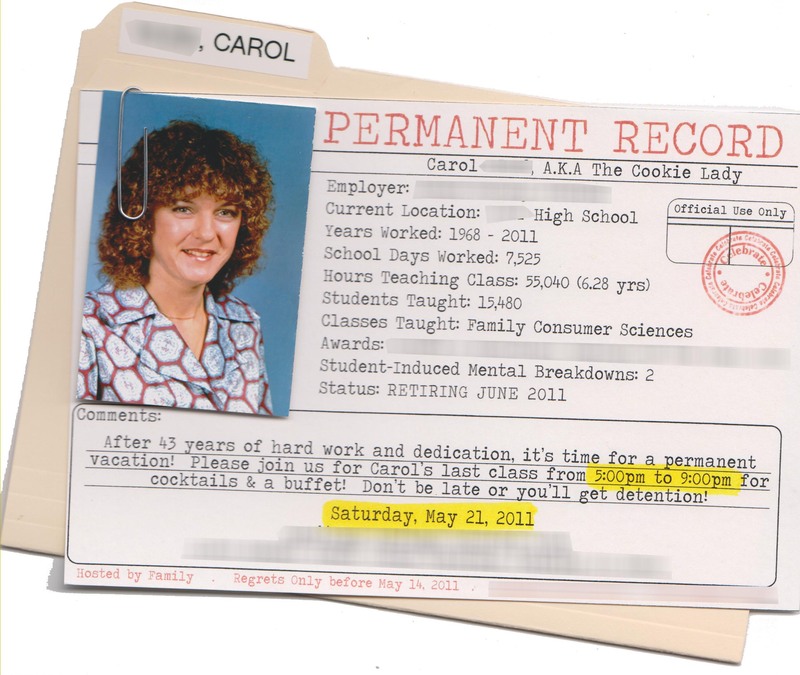 I then highlighted some of the key information and placed it in the file folder behind the invite. I used a paper cutter to cut the ‘Cheat Sheets.” This was practically free since it is items I had on hand. I sent out about 110 with a total cost to me of approximately $1.80/invitation.